Line a 1 litre loaf tin with cling film so the clingfilm is hanging over the edges. Take three large bowls and divide the whites from the yolks, putting the cream in the third. In the bowl with the yolks whisk vigorously until the yolks turn a pale cream colour. A balloon whisk is good for this. Add the honey and thoroughly combine. Finally add the orange zest and Grand Marnier and combine. Thoroughly clean your whisk and then whip the cream until it is thick. Beat the egg whites until they form stiff peaks using a scrupulously clean whisk. Any trace of egg yolks will mean they won’t whisk. Gently fold the cream into the honey and yolk mixture but don’t over work it or you will lose all the air. Then gently fold it all through the egg whites. Pour into the loaf tin and fold the overhanging clingfi lm over to cover the top. Freeze for 2 to 3 hours or better still make it a day in advance. It will keep for up to 6 weeks but make sure that once it is frozen to wrap it in tin foil for longer term storage. While the semi-fredo is freezing make the orange sauce. Segment the oranges and when segmenting make sure to do this over a bowl and reserve any orange juice. Heat the sugar, reserved orange juice and water over a medium to high heat until the sugar is completely dissolved. Add the Grand Marnier and cook until the mixture thickens. Add the segments of orange and allow them to cook for a minute or two. 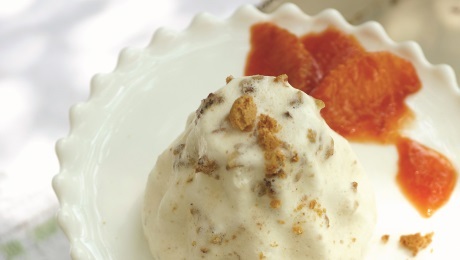 Serve the sauce cold with slices of the semi-fredo garnished with crumbled Amaretti biscuits.